Thecus D16000 64TB HGST Ultrastar Enterprise 16 Bay 3U Rackmount Expansion Unit. This Expansion requires SAS Controller Card on the NAS Head to connect to NAS. Thecus® is excited to announce a brand new unit specifically for daisy-chaining, now users have the ability to increase volume with the benefits of fast transfers and infrastructure cost savings. Below we’ll go into the concept of daisy-chaining, go into depth on the highly praised D16000 and how this innovative storage device changes the way network storage infrastructure is set up. For the first time in the storage industry, daisy-chaining technology is put in place by Thecus®. At first glance, the D16000 resembles the N16000 so much that the average user likely won’t be able to tell the difference. However, the device is a total different unit, specifically the internals. First, CPU and RAM cannot be located in the interior as there are no CPU and RAM. What are included in the D16000 are 16-bays, backplane with SAS I/O. SAS SFF-8088 cables are required to link devices together. In a nutshell, the D16000 can be viewed as a large external hard drive coupled to each other for massive volume, hence DAS for (direct-attached storage). The announcement of implementing daisy chain technology in the Thecus® line of products is a great milestone and brings wonderful advanced functions to the storage industry. A little background, daisy chain is a type of network topology for those that aren’t too familiar with the notion. Network topology is for network administrators to link two or more devices together to transfer data. Daisy chain layout is beneficial to users who often require adding more nodes to the network. In addition, this layout is an easy way to connect nodes together and requires little cable to do so. 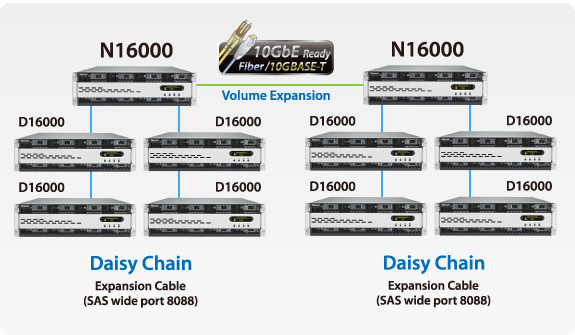 To expand volume with daisy chain, one master N16000 unit is required to guide the daisy-chaining, and then users are able to link up to four D16000 as target units. As mentioned earlier, SAS cables are utilized to link the units together to get rapid speeds. With this setup, users are able to obtain massive amount of volume, up to 320TB of storage space! The ability to reach this capacity at a low cost is something new to the industry. Volume per cost is the cream-of-the-crop for the D16000. What this means is that the D16000 cost less than the N16000, which is a bargain that innovative technology grants with daisy-chaining. Users will get the privilege to utilize more volume with daisy chain. The concept of daisy-chaining NAS together is clearly geared towards enterprise level users, with this said, large enterprises that require a vast amount of rackmounts can take advantage of daisy-chain and connect D16000 units for massive volume expansion, with massive amount of cost savings. To add, since SAS SFF-8088 is utilized to transfer data, users can rest assure that transfer speeds is unmatched. As the communication between the DAS and the NAS is secured by an SAS cable offering transfer speeds of 6GB/s, you can rest assure that the transfer of your data won’t be slowed down by the devices connectivity. Never fall behind or face down time due to power supply issues again. With a second power supply, the reliability of your DAS is guaranteed. With a simplified architecture design to perform as a DAS set-up in daisy chain only, the D16000 cuts down the price associated with volume expansion. A total of 4 additional D16000 can be added to the master unit through Daisy-Chaining. With enough space for 16 HDD each, you can expand your volume capacity with 64 additional disks, reaching a tremendous amount of terabytes!